For those who haven’t visited the Tallgrass County Club in Wichita in a while, general manager Aaron Calderon has just one message: Take a fresh look at the club and course. Changes are occurring at Tallgrass following GreatLife KC’s acquisition of the course last year, when Tallgrass was placed in the Legend Collection tier of the GreatLife KC courses. (GreatLife KC is based in Overland Park.) Tallgrass members now can play other Legend Collection courses – Canyon Farms, Staley Farms, and St. Joseph CC – with membership privileges. Tallgrass members receive playing privileges and special pricing at other GreatLife KC courses too. Additionally, Tallgrass CC will undergo a significant upgrade at its clubhouse beginning in late 2017, as the clubhouse will add a fitness center. This will bring Tallgrass into line with other GreatLife KC properties. GreatLife KC’s mission includes golf, fitness, and wellness for its members, and fitness centers at other GreatLife KC courses are a common thing. The Tallgrass CC renovation will add about 3,600 square feet to the clubhouse, most of which will be a fitness center, Calderon says. “Great Life is all about golf and fitness,” Calderon says. He says GreatLife KC consists of 18 golf courses now, but it may increase to triple that number or more soon. The Tallgrass course in Wichita was constructed and opened in the early 1980s. It’s a par-71 course. Under the new ownership, players can expect an overall improvement in the course conditions going forward. However, the basic layout of the course, which includes many beautiful homes along the course, along with plenty of water and trees, will not change. Tallgrass CC is a private course, but the country club does hold preview rounds on occasion to give non-members a chance to try the course. “We’re a country club where people can come and enjoy the people who are here and have fun and play great golf,” Calderon says. The 18-hole Tallgrass Country Club measures 6,758 yards from the tips, 6,195 yards from the middle tees and 5,215 yards from the front tees. The course is a par-35 on the front nine and par-36 on the back nine. Nearly half of the holes at Tallgrass feature some sort of water hazard, highlighted by the par-3 11th, where you’ll tee over a long water hazard to a horizontally shaped green with little to no landing area in front of it. Hole number 11 measures just 130 yards from the back tees, yet it can be an intimidating hole for those who struggle with consistent length on their iron shots. The toughest handicap hole on the front nine is the 420-yard sixth hole, which is a par-4 with a slight dogleg left. It’s followed by another difficult hole, the 202-yard par-3 seventh hole, which has a large water hazard hugging the left side of the green to catch any errant shots from the tee. On the back nine, the toughest handicap hole is the par-4 16th, which measures 454 yards from the back tees and 406 from the middle tees. This is a long par-4 with a slight dogleg to the left. The closing hole is a 403-yard par-4 that is one of the larger risk/reward holes on the course. To increase birdie chances, golfers will be cutting the corner and making a second shot over water to a green protected by water on the right side. Or golfers can play it safer and go the longer route by hugging the left side of the fairway, reducing the impact of the water on the second shot. The long-term plan for GreatLife KC at Tallgrass is to continue improving the course to where it’ll again be a premier course in Kansas that often will host special events and tournaments. A Kansas Golf Association Senior Series event was played at Tallgrass this year. The course is hoping to host more events in the near future, including USGA events and collegiate golf events. Tallgrass CC offers a driving range and a fully stocked pro shop. The course hosts about 25,000 rounds of golf per year, Calderon says. 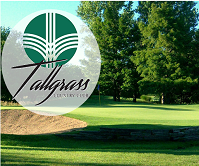 Tallgrass offers a social membership option at the club that costs $39.99 per month for individuals and $49.99 per month for families. The social membership gives members access to all of the club’s non-golf facilities, including a pool as well as the soon-to-be-built fitness center. Social members have the option of playing golf on Mondays. Lindsay Jones, Director of Sales for Memberships and Tournaments, says Tallgrass CC offers many different golf memberships too, including a junior membership for ages 35 and younger; a senior membership for ages 62 and older; a membership for members of the military and first responders; and corporate memberships. Each of these types of golf memberships is offered as a single person or a family membership, Jones says. The basic golf membership starts at $225 monthly with no cart and $325 with a cart for singles and $295 and $395 for families. The special golf memberships mentioned earlier are discounted from there. Those living at least 55 miles from Tallgrass qualify for non-resident memberships at the country club. You can add a monthly cart rate to any golf membership you choose. Additionally, Jones says Tallgrass runs other membership specials throughout the year, such as half price guest days. “We also are the only private course on the east side of Wichita that allows the public to have access to the driving range,” Jones says. “We also offer memberships for the driving range” for both families and individuals. The changes at Tallgrass are well worth checking out in person, Calderon says. Tallgrass has an on-site restaurant, and it hosts weddings and business conferences in its banquet rooms. It can accommodate up to 250 people for an event. People don’t have to be members to rent the facilities, Calderon says.